Did you watch the Super Bowl on Fox? 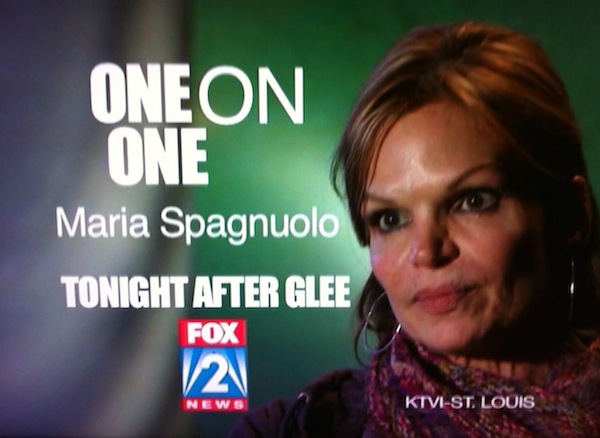 Then you’ve already seen what we’re going to talk about: Those “One on One with Maria Spanguolo” spots. Ahhhh! Damn Fox2, could have done any creepier lighting on the Rams head coache’s wife? All shadowy and has that effect where no matter what place you stand, she looks like she will put your child in a giant black pot with a boiling water and a few cut up carrots. Plus they showed the spot on seemingly every other commercial break, so that really helped in searing it to our brain just in time for bed! So much for our decade-long dry bed streak. Holy god. Kudos for Mandy Murphy, who still looks pretty good with her stock news lady hair, for hanging in there looking at that creepily lit woman with a spooky green background behind her for a whole interview. Check out this shot of Mandy they included in the spot and note the fake “Oh god how long do we have to do this?” smile. She can’t look away, she can’t ask a question and then look down at her notes until Mrs. Spagnuolo’s done talking, so she just locks on, staring right at it full-bore like those people on reality shows that have to eat something gross so they figure if they just don’t think about it and dive in they can get through it without barfing. Aaron Rodgers of the Packers had a good night Sunday, but Mandy Murphy probably did more work in that interview than Rodgers did all game. Now if you’ll excuse us, we’re tired as hell and need a nap. We spent most of last night staring at the ceiling holding in our urge to pee, hoping that the shadow wasn’t Maria Spagnuolo coming out from under our bed and wondering why we hadn’t heard from our cat for a few hours.